Your favorite Game Kicks shoes are now back and they’re even cooler! The Game Kicks II for boys and girls is the world’s first remote control shoe that lets kids play Skechers’ memory matching game in two ways. First is playing directly on the right shoe by hitting the buttons. Second option uses the brand new Game Kicks II remote control conveniently tucked inside a pocket on the left shoe. Simply press the IR button on the right shoe and start playing! 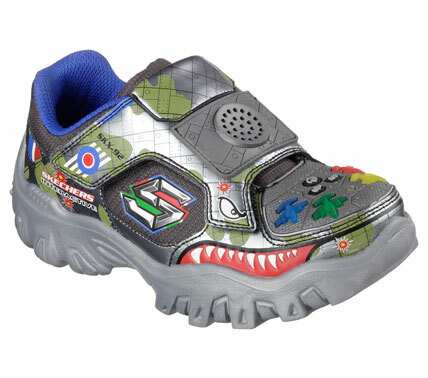 Game Kicks II Fight features smooth metallic leather, synthetic, and mesh fabric upper in a slip-on sporty casual sneaker with fighter plane design and fully functional airplane game feature with light and sound action. Now with a remote game controller! Hit the buttons as they light up to catch enemy aircraft! Hit the button on the shoe, then the button on the controller and play! Juicy Smash features a smooth leather, synthetic, and mesh fabric upper in a slip-on sporty casual sneaker with colorful design and fully functional fruit-smashing game feature with light and sound action. Now with a remote game controller! Hit the buttons as they light up to smash all the fruit! Visit Skechers stores at Skechers stores in Glorietta 2, TriNoma, SM North Edsa -The Annex, SM Mall of Asia, Robinsons Place Manila, Robinsons Galleria, Gateway Mall, Market! Market!, Lucky Chinatown, Alabang Town Center, SM Southmall, Festival Mall, SM Bacoor, SM Dasmariñas, Paseo Sta. Rosa, SM Fairview, Fairview Terraces, SM Clark, Marquee Mall, SM Pampanga, SM Ilo-ilo, Ayala Center Cebu, SM City Cebu, SM Seaside Cebu, SM Bacolod, SM Davao, Abreeza Mall, Gaisano Mall Davao, LimKetKai Mall CDO, and Centrio Mall CDO. To learn more about Skechers, visit www.facebook.com/SkechersPH and follow @SkechersPH on Twitter and Instagram.